Simplicity is an art, and one that is needed when traveling. The Tree House does a good job of keeping the space clean, uncrowded and functional, yet architectural features such as high ceilings, large windows and exposed overhead beams supply a calming sense of space as well. 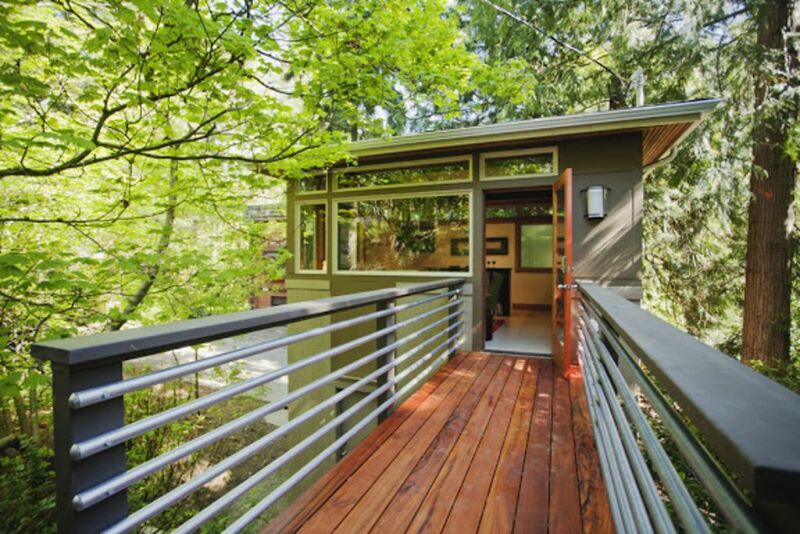 Coupled with all the amenities needed for comfortable stay of a week or longer, this Seattle Tree House is the perfect home port for your return at night, or a quiet place to chill during the day. **The Urban Tree House was featured in the National travel show 'Sweet Retreats', one of three homes in the Seattle area. I've spent my life (50+ years), living and working right here in Seattle. Having taken advantage of what this area offers with a plethora of outdoor activities, moderate 4 seasons, and urban amenities, I'm constantly surprised that there is so much that I've yet done/discovered. I've put my heart and soul into this little piece of property (literally), custom designing it to take full advantage of the site. I hope it will become an important part of your Seattle experience, allowing you to enjoy the great Northwest the way the big guy upstairs intended it to be experience. This property gives a very unique Northwest experience. Seattle is full of little gems tucked away, not many available to the traveler to live in. My property is located in a deep ravine listed as a Critical Environmental Area. Although the Tree House is close to the road, it's still buried amongst the towering trees, giving it the privacy a thick Northwest forest provides. Walk to the back of my property and you're overwhelmed by the acres of untouched nature and year-round creek; truly a calming environment. There are not many areas you can be in the “woods” and still be in the heart of the city, 10 minutes (on a good commute, 20 on a bad) from downtown. The bathroom is fun. It's compact, but because of its high ceilings it doesn’t feel cramped. It has a full-size shower and plenty of floor space to move around and dry off on the black tile floor. Radiant, works wonderfully, and quiet! However, the place is so well insulated it stays warm in the winter, cool in the summer. Two sets of towels, two sets of sheets and pillow cases. You need not bring a thing, unless you have a favorite blankie. One spot off street, plenty of on-street parking for guests. If you have a large item (i.e. : canoe, paddle board, etc. ), we have a safe outdoor area for storage. There is a dining bar upstairs, plus an outside table and chairs on the lower patio. Let's just call it the relaxation room. This is the room that makes you feel you are in a tree house. The large windows look out/through the surrounding trees. Full sized and fairly quiet. 12 full cubic ft. Not huge, but it will hold whatever you’ll need and keep it cold. Four burners and a full-sized oven, electric with a glass stove top. Go nuts! Yep, got one of these too. Does two slices at one time. There is also a waffle iron, crock pot, and blender. Plates, cups, bowls, glasses, wine glasses, utensils, all in sets of 4. Full kitchen with pots and pans utensils, plates, even plastic wear and paper plates for picnics. You just supply the food and talent. Big screen upstairs (47-inch), a cozy 20-inch screen in the bedroom. Xfinity (Comcast) Cable. There are plenty of channels, even HBO. CD and iPhone ready. I believe it has inputs and outputs for other systems, too (sorry, this is not my area of expertise). Blue Ray and DVD. There is no video library, but several Red Box locations are nearby. Cookbooks as well as novels. A great venue to sit back, relax and become absorbed into a book or two. I'm working on building this. For the time being, you’ll find playing cards and backgammon. The house is surrounded by mature, huge trees. Maintenance is mostly pulling invasive ivy and blackberries and replacing them with native plants. Small boat rentals are close by on Lake Union, Lake Washington, and Greenlake. All rent boats by the hour. The Tree House is two stories. The lower story has a gravel patio, the upper story has a bridge leading to a path connecting to the lower patio. Seattle has more then its share of rental shops. Just ask, and I'll point you in the direction of one or two. Several ski areas are between two and three hours drive away. There is a community pool less then a mile away. Of course, public beaches on Lake Washington, Greenlake and Puget Sound are all minutes away. An attractive two-person spa, nicely tucked away on the lower patio just outside your bedroom. It's private, yet nestled amongst the native foliage. What a lovely spot and so well appointed. It had everything we needed and then some. Quiet, secluded spot surrounded by big trees and many birds - even multiple Heron sightings. Close to food, shopping and freeway access, capped by gracious and helpful hosts next-door. Rip around Seattle, chill, hot tub, sleep, coffee, rip around Seattle x 3! Perfect place in all honesty. Would do it again without hesitation. Beautiful and relaxing little place! So excited to go back. Kirk was extremely friendly and helpful and the treehouse was super nice! A great getaway for my wife and I. Beautifully, comfortably and thoughtfully appointed space with high end finishes in residential area. Easy access to public transportation. My wife and I loved The Urban Treehouse!! It was a perfect escape and in close proximity to the Wineries and Downtown. We sat in the two person hot tub every morning with our coffee to get the day started and at night with a bottle of wine to end a perfect day!!! Kirk was wonderful and available to answer any and all of our questions. Can’t wait to make a return appearance!!! Thank you! We loved our stay in the treehouse! Well located for exploring the city, or as a jumping-off point for exploring the surrounding area. For those wanting to experience Seattle like the locals do, the Burke-Gilman bike and walking trail is an easy mile from your home. The trail connects to countless others, taking you to the wine country of Woodinville and Redmond, the sand beaches of Golden Gardens, boat rentals at the University of Washington, or touring neighborhoods throughout the city. Lake City has its farmers market on Thursdays, a great place to stock up on fresh produce, meat, and flowers, or to get a bite from one of many food vendors. Many neighboring areas have farmers markets on other days throughout the week. Seattle has so many festivals, events and activities to enjoy year-round, and this location provides easy access. Just step out and explore! A one time cleaning fee of $50.00 9.8% Washington State Tax. .